Traditional music has been a huge component of the girls’ lives from day one. Coming from a musical heritage of singers, dancers, and fiddlers, it was a natural progression to learn both stepdancing and the violin at an early age (4 and 6 to be exact). 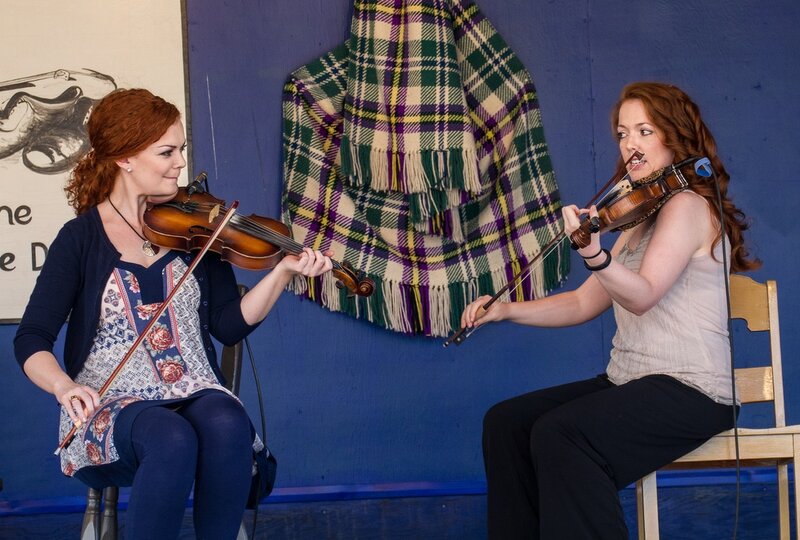 Being of Scottish descent and growing up in the vibrant community of Mabou, both girls took the Gaelic language as a course both in high school and University, and try to incorporate the Gaelic inflections common to their ancestors in their playing as considered a traditional sound of the Cape Breton area. In 2009 the girls then attended one of the largest Celtic Festivals in the world, Fesitval-Interceltique in Lorient, France, headlining numerous shows as part of the official events of the Festival. Only a few weeks later, Margie and Dawn traveled to Hull, England where they kicked off the Clipper race 09-10 with the Cape Breton Clipper boat entry! And in late October, the girls also made the trip to Brazil to welcome the Clipper into Port! It was a whirlwind trip that incorporated playing for the crew and an impromptu performance for the locals! In addition to a busy performing schedule, Dawn is currently the Artistic Director for the Celtic Colours and Margie works in marketing/design at the Gaelic College.